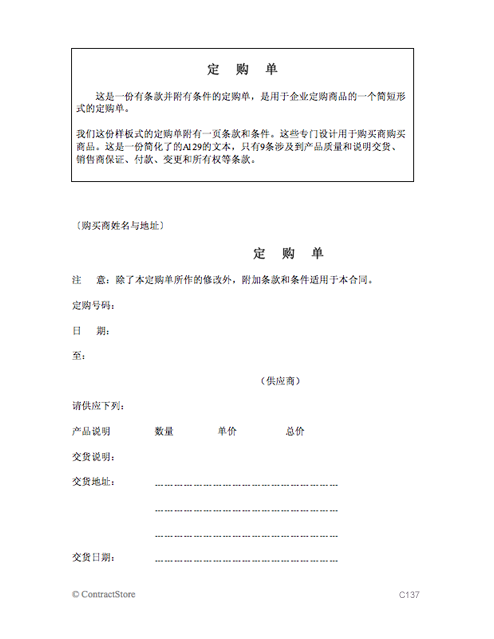 This Chinese purchase order form is in two versions – English and Chinese. 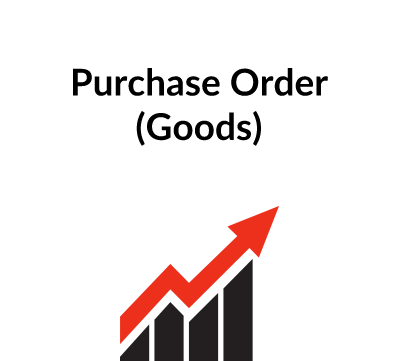 This is a short form for use by a business when ordering goods. 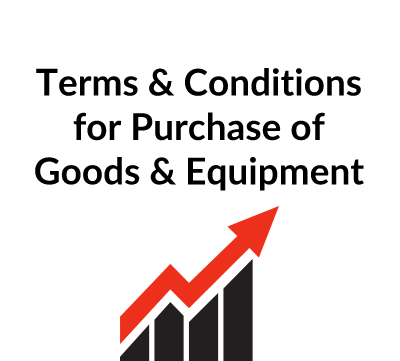 Our template purchase order is accompanied by a single page of terms and conditions designed for use by a buyer of goods. This is a simplified version of document A129 running to only 9 short clauses dealing with quality and description of goods, delivery, seller’s warranty, payment, variations and title. This document is intended for use by a sole trader or small business which from time to time wishes to places orders for the purchase of goods. The document consists of a suggested form of Purchase Order which will have the Buyer’s name and address etc at the top of the page. Depending on the Buyer’s requirements, the contents of the Purchase Order may require some adjustment. 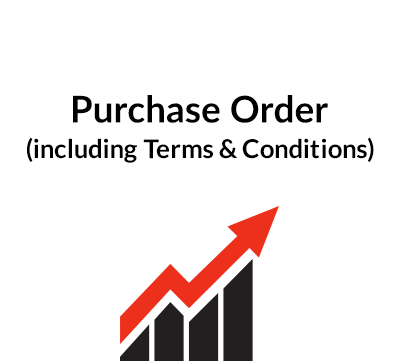 Annexed to the Purchase Order are standard terms and conditions which can be printed on the back of the Purchase Order. 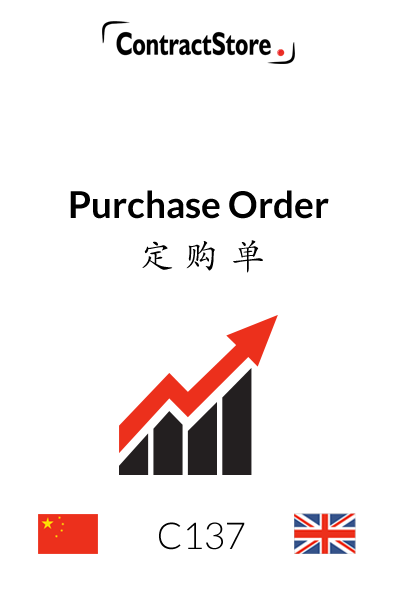 This again refers to the Purchase Order so the delivery arrangements should be spelled out there. However, if they are not, this clause requires delivery to the Buyer’s address. The clause makes it clear that the Supplier is responsible for secure packaging etc. Risk of loss or damage remains with the Supplier until the Goods are delivered. Ownership of the Goods will normally also pass on delivery. But if any payment is made on account before delivery, ownership is intended to pass at that point.The Supplier is then required to identify the Goods in his premises as belonging to the Buyer: this wording is designed to help if, for example, the Supplier goes bankrupt before the Goods have been delivered, although bankruptcy can complicated from a legal point of view and there is no certainty the Buyer would be protected. The governing law of the contract and the courts which will handle the dispute are referred to here.For other clauses and for more detail on governing law and disputes, see our Miscellaneous documents on our website. “1. The governing language of this agreement is Chinese/English/other. 2. This agreement shall be governed by and interpreted in accordance with English/Chinese law.